These better-for-you drinks could be adding hundreds of calories to your otherwise healthy diet each day. You’re exercising, watching your refined carbs and refraining from second-helpings, yet you've reached a weight-loss roadblock. It may be time to consider some unexpected reasons why you can’t meet your weight loss goals. Assess the liquid calories you’re drinking. Sometimes, it’s hard to understand what’s healthy and what’s not. Juices like apple, cranberry and orange sound healthy, but calories from these fruits juices are mostly from sugar. “Most dieters know soda is ‘bad’ so they substitute ‘healthy drinks’ like fruit juice, but what they don’t realize is the caloric cost,” explains Dr. Besser. An 8 ounce glass of orange juice is 110 calories while a 12 ounce can of Coke is 140 calories. “No real savings there and of course most of us don’t stop at 8 ounces, a more typical size is 12 to 16 ounces,” adds Dr. Besser. According to a study from The American Journal of Clinical Nutrition, sugar-containing beverages are said to be responsible for body weight gain. Alcoholic beverages are much higher in calories than people realize and are also metabolized to sugar, not good if you are trying to restrict sugar intake, Dr. Besser says. For example, a 5 ounce glass of wine is about 120 calories, a 12 ounce beer is about 150 calories and a two ounce portion of whiskey (as an example of a “hard liquor”) is about 140 calories. “And alcohol is used in addition to a meal, not to replace one, so lots of empty calories there,” she adds. Even more of a culprit is sugary-mixes for cocktails and frozen drinks. On the other side of the spectrum are the diet drinks like artificially-flavored sparkling waters, diet soda and other low-calorie beverages. They, too, can cause dietary sabotage, although in a different way. Dr. Besser says one would think that by using diet drinks you are saving calories, yet while true, recent studies are suggesting that diet drinks actually don’t cause the body to feel full. “Because there is no nutrition in these beverages, the hormones that contribute to eating (cravings) aren’t turned off by these beverages so you are still hungry and turn to food,” she says. “And, since these artificial sweeteners can actually be sweeter in taste than sugar without nutrition, it can further stimulate the craving centers in the brain and GI tract.” A recent study from Yale University reports that when sweetness and calories do not align, the body’s metabolism is fooled, and when this “mismatch” occurs, the calories fail to trigger the body’s metabolism so your brain may not realize calories have been consumed. 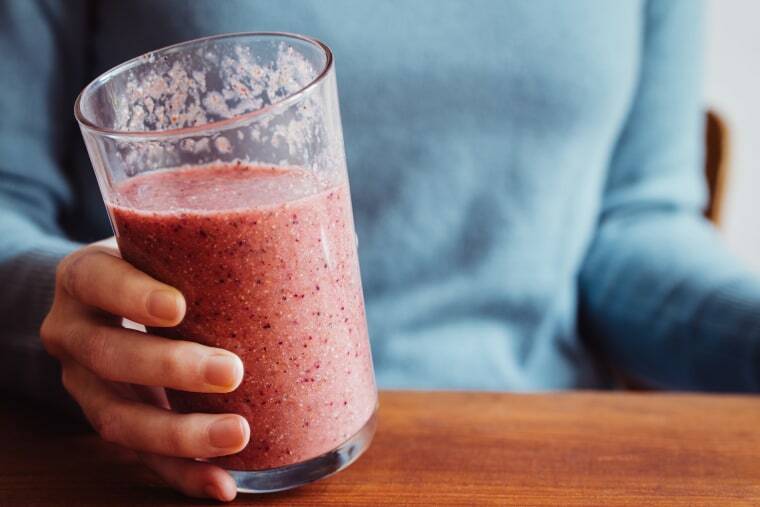 To help with satiety, choose one with protein, such as milk or a smoothie made with added protein powder or with yogurt, which will help provide a better balance of nutrition. “Drinking the occasional calorie-containing drink is OK, but in general, limit calories in the liquid form and save them for food,” says registered dietician Natalie Allen, an instructor of biomedical sciences at Missouri State University in Springfield, Missouri. Research published in Clinical Nutrition and Metabolic Care shows that consuming carbohydrates in a solid form from food promotes a feeling of fullness, verses consuming a liquid form of carbohydrates, which leaves one feeling hungry. The best drink is of course water. “But if water bores you, try caffeinated or decaffeinated teas,” suggests Stephanie Schiff, RDN, clinical registered dietitian, Huntington Hospital, Northwell Health in Huntington, New York. “Green tea in particular is high in antioxidants, and has no calories. Herbal teas, which are actually not true teas, but infusions of parts of edible plants or flowers, usually have no caffeine. They taste wonderful, and have no calories unless someone has added sugar or sweetener to them.” If you’re craving bubbles, try original seltzer or club soda, which are both calorie and caffeine free.